From Winchester’s Ranger Law Enforcement division comes the standard by which all 9mm full metal jacket rounds are measured: the 124 grain NATO round. When the North Atlantic Treaty Organization standardized on 9mm as a cartridge, it also standardized the bullet weight as 124 grains, or approximately 8 grams. NATO also specified that these rounds be loaded slightly hotter than US commercial market 9mm ammo. Since then, the NATO 9mm has served in countless conflicts and established a tremendous reputation for reliability. Despite being loaded somewhat hotter than commercial ammunition, these 9mm NATO rounds are still safe for use in modern manufactured 9mm firearms. These rounds are clean burning, accurate, and reliable. 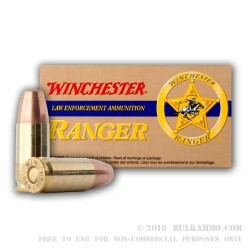 Winchester’s Ranger division has been producing ammo for the military and law enforcement for quite some time, and they know how to make these rounds right. 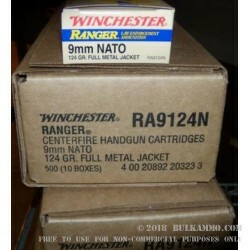 The Winchester Ranger 124 grain 9mm NATO rounds come in boxes of 50 with 9mm NATO markings on each box. Make sure to keep them separate from lower pressure commercial rounds!